Boy, do US financial regulators have a deal for you: buy digital coins, travel to luxurious resorts...and learn how not to get scammed out of your life savings. The Securities and Exchange Commission on Wednesday launched the howeycoins.com website, which looks just like one of the investments that have flourished in the Bitcoin era, complete with celebrity endorsements, research, and pictures of tropical destinations. But all the links for the initial coin offering take you to education sites that warn against giving money to dubious investments and without doing thorough research. "It's just so ripe for fraud," said Lori Schock, director of the SEC's Office of Investor Education and Advocacy. Just four years ago her office fielded fewer than 10 complaints about dubious cryptocurrency investments. Last year there were well over 120 and "this year it continues to grow," Schock told AFP. People put money in and then find they cannot get it back out and no longer get a response from the company, many of which are located overseas. The SEC has taken action and shut down several fraudulent schemes that amounted to tens of millions of dollars but the scope prompted her office and SEC Chair Jay Clayton to ramp up their public outreach. "We're never going to be able to litigate our way out of investment fraud," Schock said. "It comes down to investor education so they will recognize the red flags." The Howey Coins site, which was developed in just a few weeks with SEC staff doing the design and content, with suggestions from other state and national regulators, features a host of those red flags. 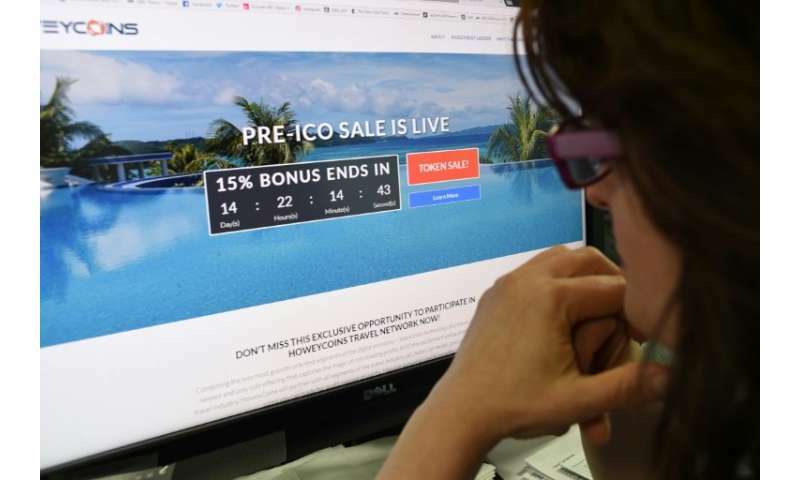 It has a countdown clock to drum up excitement, and various investment levels offering special discounts, and promises it is registered with the US government, all accompanied by a serious of attractive stock pictures of luxury resorts, palm trees and sparkling wine. It has photos of the company's staff but no biographies—actually SEC employees, several of whom seem to be wearing the same glasses—and fake celebrity endorsements. "The rapid growth of the 'ICO' market, and its widespread promotion as a new investment opportunity, has provided fertile ground for bad actors to take advantage of our Main Street investors," Clayton said in a statement. "We embrace new technologies, but we also want investors to see what fraud looks like, so we built this educational site with many of the classic warning signs of fraud." The site also includes an impressively worded white paper, complete with graphics, that promises discounted travel without ever explaining how an investor would recoup their money. Schock called it "nine pages of nothing." "Fraudsters can quickly build an attractive website and load it up with convoluted jargon to lure investors into phony deals," said SEC Chief Counsel Owen Donley, who doubles as Howey Coins co-founder "Josh Hinze." One investment scam the SEC shut down in late March, AriseBank, claimed to have raised $600 million and was endorsed by former heavyweight boxing champion Evander Holyfield. Schock said the key messages to investors were to do background checks on company representatives to see if they are registered as investment advisors, check the SEC website to find out if they have been involved in fraud previously and never to invest with a credit card—something legitimate firms will not allow. "What they're touting, the currency or the product, may be virtual but the pain is real," she said, urging investors in all cases to not invest more than they can afford to lose. While it is a serious subject, the SEC staff included some "Easter eggs" on the site that have references to key bits of the agency's history. One celebrity endorsement is from an apparent millionaire named "McWhortle," also the name of a fake stock investment the SEC launched in 2002 also to educate investors about scams. Another is a boxer "@boxingchamp1934"—1934 was the year the SEC was created. And the Howey Coins name is a reference to the Howey rule, from a 1946 legal case that determines whether a transaction is an investment—in which case it falls under SEC jurisdiction.